CHAPTER - Chattanooga Alumni Chapter Kappa Alpha Psi Fraternity, Inc.
On Sunday, January 22, 1939, a group of Kappa Brothers met at “Paul Tatum’s Place” for the purpose of organizing in Chattanooga. Members present at the meeting were Alex F. Carney who served as chairman, Alfred Scott, A. D.
meeting. The dues were set at twenty five cents a week. Total collection at that meeting was twenty four cents, of which ten cents was spent on a deck of cards. At the February meeting the group was joined by Brothers Roy O. Vaughn, Oliver Bryant, Thomas Prater, K. N. Williams, Robert J. Smith and Bruce Rumley. & Reporter; Willard A. Boone*, Board of Director; William P. Malone*, Board of Director; Daniel F. Provine*, Alphonso D. Robinson* and Armature Z.
Curtis Norris, Curtis Walker, Fluker Walton and Percy Williams. other new names to appear on the records were: Louie Robinson, Charles “Billy” Green, Samuel Hill, Carl White, Freddy White, Donald Elligan, Kenneth Fearn and John P. Franklin. In 1952 the chapter organized the “Kappa Kowboy Kontest” in which each brother was to sponsor a boy between five and ten years of age. All of the money raised was used to buy shoes for needy children. Some of the young men in the first contest who later became fraternity members were: Lamont Vaughn, Warren Logan, Jr. and Cicero C. Henderson, III. The first “Kontest” raised almost $2,600.00. In 1965 Chattanooga Alumni Chapter appointed James E. Jones and Carl E. White as it’s first Dean and Assistant Dean of Pledgees. Charles W. Fields was the chapter’s first initiate. elected as the first African-American City Commissioner, later becoming Vice Mayor. He served as Commissioner and chairman of the school board for twenty years. During this period of time James E. Jones, Dr. C. C. Bond and Sherman Matthews were other Kappamen elected to serve on the School Board. In 1998 his son, John P. “Duke” Franklin, Jr. was elected to the City Council. Moses Freeman, Jr. serves as Executive Assistant to the Mayor and was 1998 President of the multi-million dollars River Bend Music Festival. From 1974 to 1992 Clarence Bernard Robinson served as Hamilton County’s first African-American state legislator since the reconstruction period. On the national scene Marvin L. Cousin, Jr., served on the Democratic National Platform Committee during the administration of President Jimmy Carter. Former Hamilton County Commissioner Arthur C. Campbell currently serves as Deputy Undersecretary for Rural Economic and Community Development in Washington, D. C. Brother Campbell was appointed during President William J. Clinton’s administration. Several brothers are prominent in the fields of hospital and health administration, a number of brothers are leaders in fire, police and security administration. Chattanooga Kappas are also leaders in other fields of human endeavor such as Religion, Public Housing Administration, Finance and the Urban League. In higher education, Richard L. Brown, Jr. was named Vice Chancellor of Operations at the University of Tennessee at Chattanooga. In Sports, Nathaniel H. Anderson became the first African-American to become a regular official in the Southeastern Conference. He also served as president of the football association. In hospital and health administration, Irvin O. Overton serves as Executive Vice President of Erlanger Medical Center. Lamar J. Partridge is a leader in the field of finance and President of Valley Capital Corporation, which provides equity and debt financing to small and minority businesses. 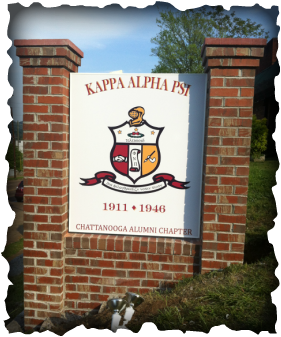 The Chattanooga Alumni Chapter of Kappa Alpha Psi held its meetings at the homes of kappamen until May 1965 when the Chapter purchased the Fraternity House at 1014 East Martin Luther King Boulevard, formally East 9th Street. Historically, the house once served as a female dormitory, cafeteria and chapel for Zion College, which was a black business and religious oriented college.